Well Christmas is officially getting close now. We’ve started our advent calendar, and the kids are getting excited. 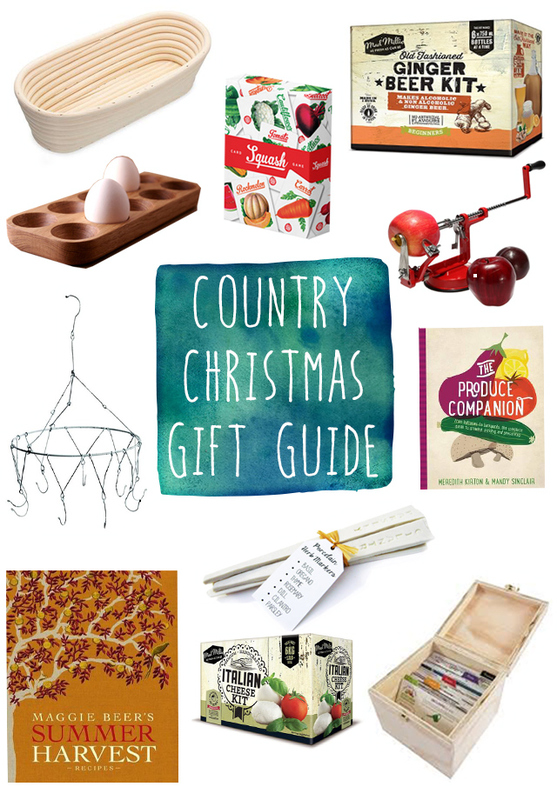 Truth be told, so am I. I’ve been asked just what do you get someone who is trying to live a more simple life, so today I’ve put together my Country Christmas gift guide. It’s a combination of some of my most favourite, most used things, as well as a few items I’ve been eyeing off for our farmhouse for a while now. Check them out below! We love to make our own bread to eat with soup over the winter months. I have been eyeing off a bread proving basket for several years now. This one makes a long loaf, but there are also french stick and round loaf baskets. When we visited Melbourne back in June, we visited an urban community garden where they were selling these gorgeous snap card so I picked up a set. They are nice large cards made from heavy card. Perfect for little hands to play snap, and learn their vegetables at the same time. Growing up, we occasionally made ginger beer, though for the life of me, I cannot remember how. I’ve often thought that it would be a great activity to do with my own kids. My kids love the apple slinky machine, and it has doubled the number of apples being eaten at home. This is a great non-toy gift for kids of all ages. I bought this book for CB for his Birthday. It combines the best of both gardening and cook books, teaching you how to grow your produce, and then how to cook it once it is harvested. Kyrstie, one of my blog friends has created this awesome garden in a box. It comes with everything you need to start growing your own vegetables. Organic seeds, and most importantly, instructions on when and how to plant the seeds, and how to look after the plants as they grow. Perfect for the wanna be green thumb who is keen to start, but doesn’t know where. I’ve had several goes at making my own mozzarella now, and I cannot believe how easy it is to make. This kit is a perfect starter for people who want to have a go at making their own cheese. These are just so pretty. Throw a couple of packets of seeds, and a large pot in with the markers, and you have the perfect gift for someone who only has a small yard or balcony, or for your green thumbed friend. There are lots of other styles on Etsy too! Who doesn’t love Maggie (we are on first name basis with all our favourite cooks around here!)? Her latest series of cook books focus on fresh seasonal produce, just like what we do here on our farm. Just the gift for the family foodie. Perfect for drying herbs for the winter months when they don’t grow so well. I saw a wooden egg holder on Downton Abbey (of course) and immediately thought that we needed a couple for our chickens, and suggested CB whip one up. As he hasn’t got to it yet, I’m eyeing off these beautiful hand made ones on Etsy. So there you have it. Eleven (yes I know that it is a weird number) gift ideas to give to someone special this Christmas. What are you getting your friends and family for Christmas this year? Got any great present ideas? I’d love to hear some more suggestions! Genius! We have nine kids in this family and there is always A LOT of stuff around – especially at Christmas – so these gift ideas are fabulous. I really like the idea of a beer/cider kit and the cheese kit…and I wouldn’t mind the herb drying rack for myself (will be dropping hints from now!) Thanks for the inspiration Jo. Some lovely ideas here Jo. Might have to check out those cookbooks and the apple slinky machine. Love our apple slinky machine.